The solution for chocking arrangements with limited height Chocking heights beginning at 20 mm!!! Tools for adjusting the element are available. With a special tool even adjustment through the bolt hole is possible! Vibracon® SM Low Profile elements are permanent, strong and reusable equipment mounting chocks that are easily and accurately adjusted. The Low Profile elements are the economic solution for repair projects or fixed design systems where expensive milled chocks, shims or epoxy resins were inserted. The Vibracon® SM Low Profile creates the ideal mounting plane for critically aligned machinery in those applications where the original Vibracon® SM is too tall. All Vibracon® SM elements accommodate the normal angular differences between machines and the mounting base without expensive machining of the base or the extra work of epoxy resins. The capability of self-levelling combined with the height adjustment feature eliminates the possibility of equipment "soft foot" in the production line and for the life cycle of the machinery. The Vibracon® advantages over conventional chocking systems are reduced production time and costs. Further, the mechanically stiff mount is rugged, easy to install, easy to adjust in the field and the elements stay reusable for life of the machine. Specifically, the Vibracon® SM Low Profile configuration addresses those applications where the foundation to component chocking height has been established by previous design or chocking methods. Those other chocking methods are time consuming and do not support the life cycle needs of the machine owners and installation activities on a tight schedule. The Low Profile elements have been installed in mission essential marine propulsion and power environments and in a variety of industrial and packaged unit applications. 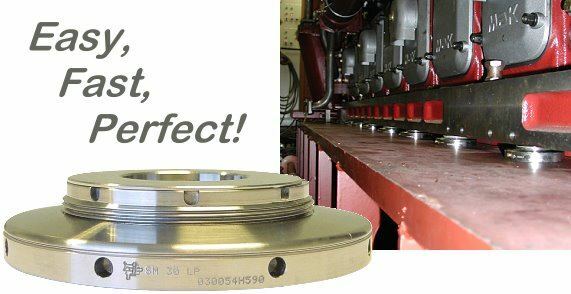 Customers whether at the wellhead through the pipeline, power plants, production lines or riding the rivers and oceans have been amazed at the speed of mounting and quietness of a perfectly mounted system after Machine Support's Vibracon® SM system has been installed. The Vibracon® SM elements have received approval from classification societies, equipment manufacturers and military applications with Grade A shock installations. Engineering support for specific needs, non-standard applications or installation training is available. Recommended minimum clamping length (B) for all types of machinery is 150 mm. This, in combination with the bolt torque from the table below, results in a bolt stretch of 0.2 mm minimum.